We were in Panama last weekend for www.ironmanpanama.com and had the opportunity to get in a day of fishing. 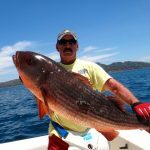 I had heard from another captain that this was the right time of year to hit billfish on the pacific side so researched Come Fish Panama and gave them a call. I have been out fishing a lot of places on good boats and bad ones. Captain Kerry runs a first class operation! He arranged our flights from Panama City to David, airport pickup, accommodations at Hotel Boca Del Mar, information for onward travels and the airport to airport transfer from the domestic to international airports back in Pan City. 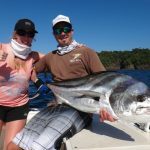 We fished from a well maintained center console 29 footer with twin 225HP outboards that got us out there to the fish promptly, and within 20 minutes of getting hooks in the water we had a black marlin on the line. The on board tackle was high end and well maintained. Brothers Jose and Michael were the captain and crew that we fished with and they were very accommodating to my son and I and my friend who had never fished offshore before. My son is only 7 and I have had skippers that were hesitant to take kids that age offshore in the past. 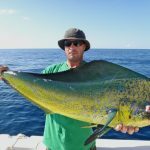 No such problems with CFP and they even mixed up the types of fishing we did (trolling, bottom fishing, top casting, bait drifting) and species we pursued to keep him engaged in the activity. After 9 1/2 hours on the water the little guy really didn’t want to quit so they stopped halfway back on the way in so he could catch a couple more snapper off the bottom. Back at the dock they cleaned and cut up a nice pargo snapper that the kitchen at Boca del Mar cooked for our dinner. 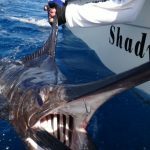 CFP policy is to photograph and release marlin and sailfish to conserve this resource. They provide tuna to locals in the area as this part of Panama doesn’t have a lot of industry or high paying jobs. 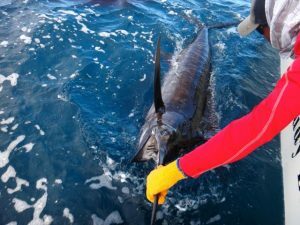 My son will not soon forget touching a marlin, feeling the bill and sail and looking him in the eye before we unhooked him let him swim away. We will certainly be back to fish with Come Fish Panama.